When they looked at the medals, they noticed that the back said "women's"
Any Olympic gold medal is a good gold medal, if you're the U.S. men's curling team. Still, it was nice to get the right ones after initially being presented with the medals stamped out for the women's winners at the Pyeongchang Games. 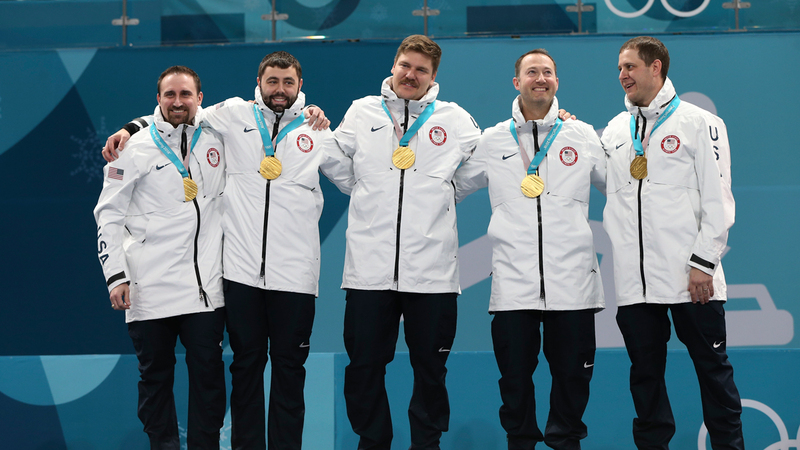 After beating Sweden 10-7 in the championship for the first ever American gold medal in curling on Saturday, the team led by John Shuster took the top step of the podium to receive their prizes. But when they looked at the medals, they noticed that the back said "women's." Alternate Joe Polo's was the only one that was correct. The right medals were quickly retrieved and swapped out. I hope the guys didn't bite into those Gold medals too hard before the exchange. I'm sure the women who win the Gold medals won't be too appreciative of the guys' teeth marks or saliva on their medals! 🤣 Congratulations to the U.S. curling team!